Last year, winning an NCAA Championship and qualifying for my first USA team going to World Championships was simply amazing. 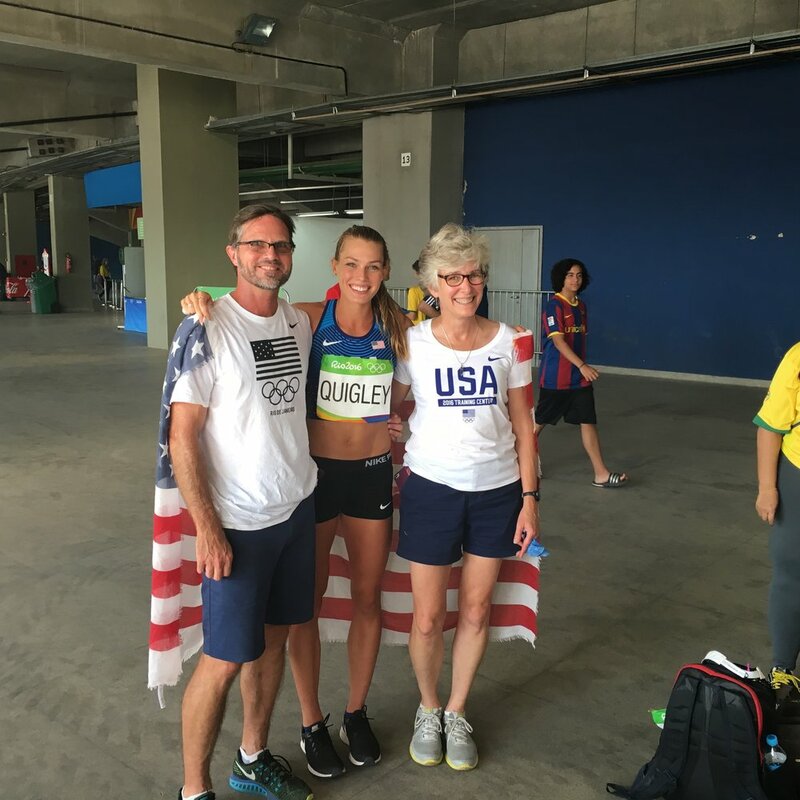 What many people didn't know was that from April of that year through Worlds in August, I had been struggling with a hamstring injury and taking anti-inflammatories in order to get through the pain and compete on the world stage. It wasn’t until September, after taking time off and stopping the medication, that I realized how much damage I had really done to my body. While I have no regrets about the decisions I made with my coaches to continuing training and competing, I did have to pay the price all fall and winter. It took me a long time and a lot of doctors to get back to running. With the help of USATF, I went to Indianapolis a few times to see the professionals at St. Vincent Sports Performance. Dr. Todd Arnold, Darrell Barnes, and Dr. Joel Kary lovingly gave me the TLC my body was needing. By Christmas I was logging a few miles. My coach, Jerry Schumacher, got excited with my progress and we decided to go to altitude camp in Flagstaff, AZ with the rest of my team from Jan-Feb. Team photoshoot in Park City- we were a little excited for the beautiful blue uniforms! After the Trials, my team and I headed back to Park City for 3 more weeks of altitude training. 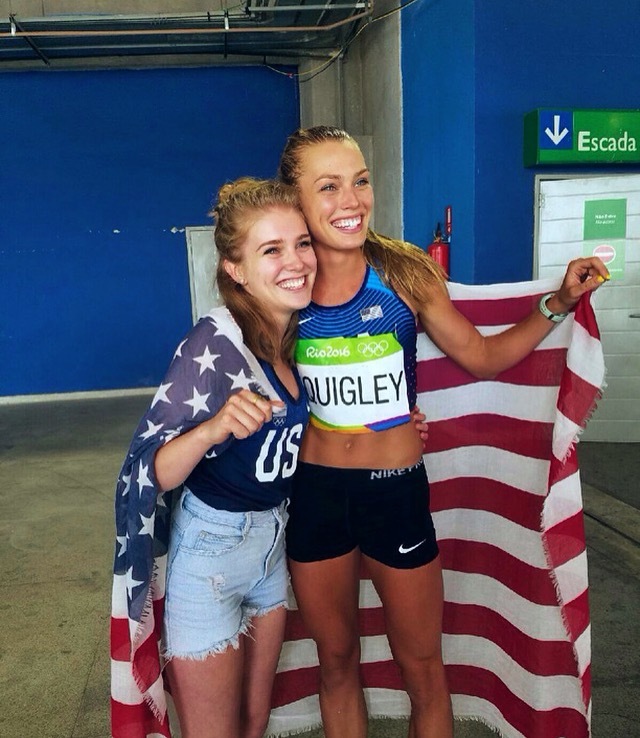 All of the BTC girls were riding that Olympic Trials high for the first week or so, every morning waking up and telling each other "we are still Olympians!" We were all doing interviews over the phone with reporters and radio shows and Skype interviews with TV stations almost every day for a week. After Park City we went to Madison, WI for a week to train in the heat and humidity of the Midwest. 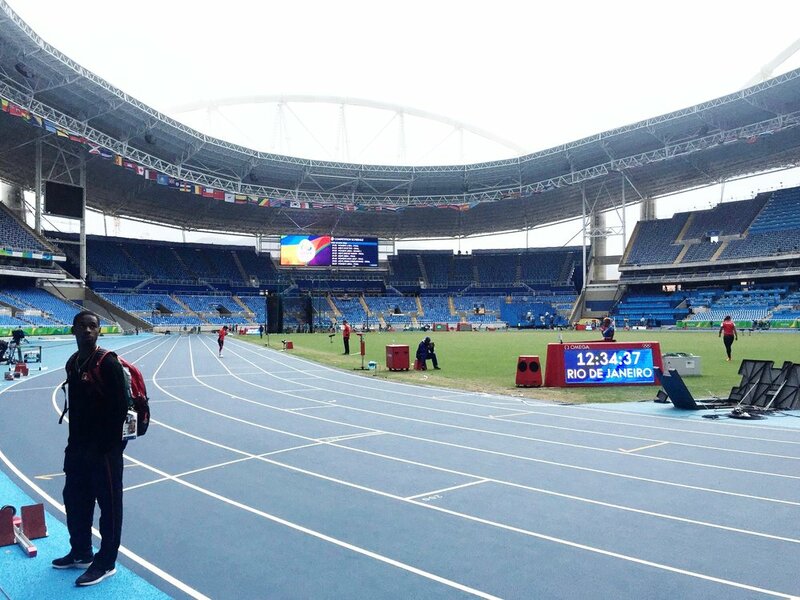 The weather there was very similar to what it would be like in Rio and our Coach used to coach for the University of Wisconsin so he was familiar with the area and knew we would have access to all the facilities we needed for training. 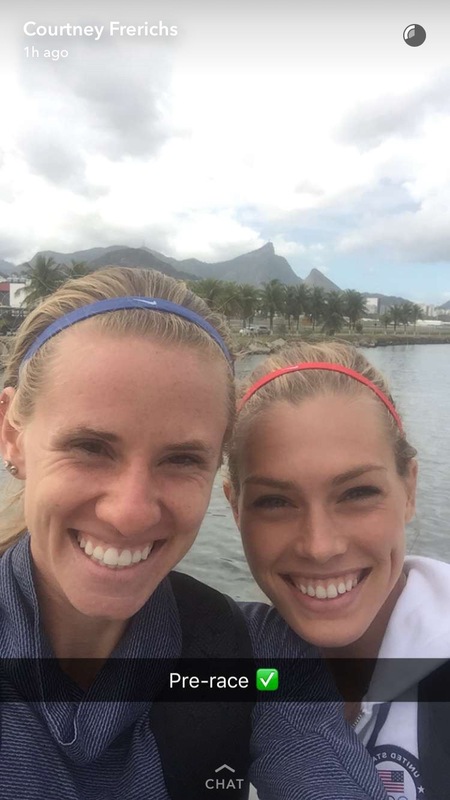 We had our last hard effort on the track in Madison, then flew down to Rio de Janeiro! The 5 weeks between the Trials and Rio flew by. We went from Madison to Atlanta, then 10 hours from Atlanta directly into Rio. Rio's time zone is only one ahead of the East coast, so the time change was not tough to adjust to at all. The first thing we did after arriving in Rio (after dousing ourselves with bug spray of course!) was head out for a run in Flamengo Park, the park and bike path right in front of our hotel. The park ran next to a beautiful beach and we could feel the ocean breeze that kept us pretty cool and we didn't see a single mosquito. So far so good! Overall, I enjoyed the city of Rio with its beautiful landscape and friendly Cariocas (residents of Brazil). The heat and humidity was not as extreme as we had braced ourselves for. August is in the middle of winter for Brazil and it was in the upper 70s to low 80s every day. Team USA had access to a track at the naval base, Escola Naval, located very near to our hotel. We went there whenever we needed to use the track, get treatment, take an ice bath, and even eat lunch or dinner. The competition stadium was about 40 minutes from our hotel and I only went there one day for practice before my first race. 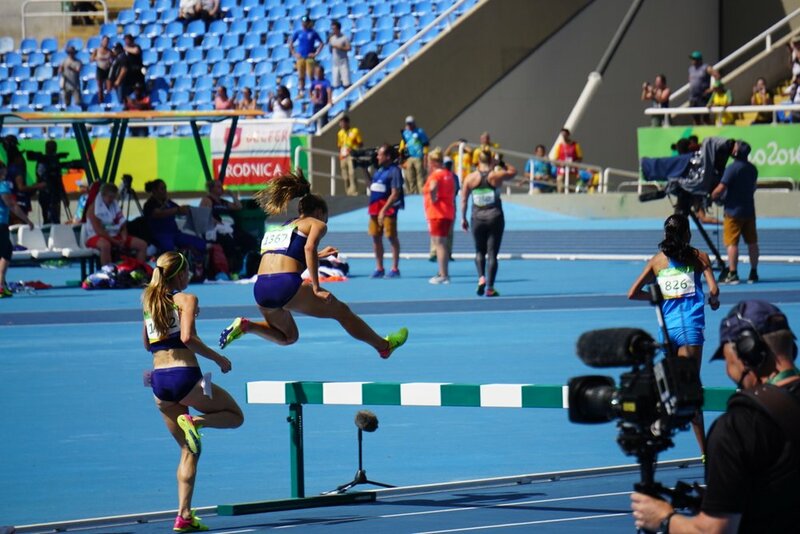 I was in the first of three heats of the steeplechase for the preliminary round on Aug 13th. Top 3 from each heat automatically qualify to the final plus the next 6 fastest times overall. On paper my heat was the most competitive, so I knew that if the pace was as fast as I expected it to be that I would only have to be 4th or 5th to make it through to the final. 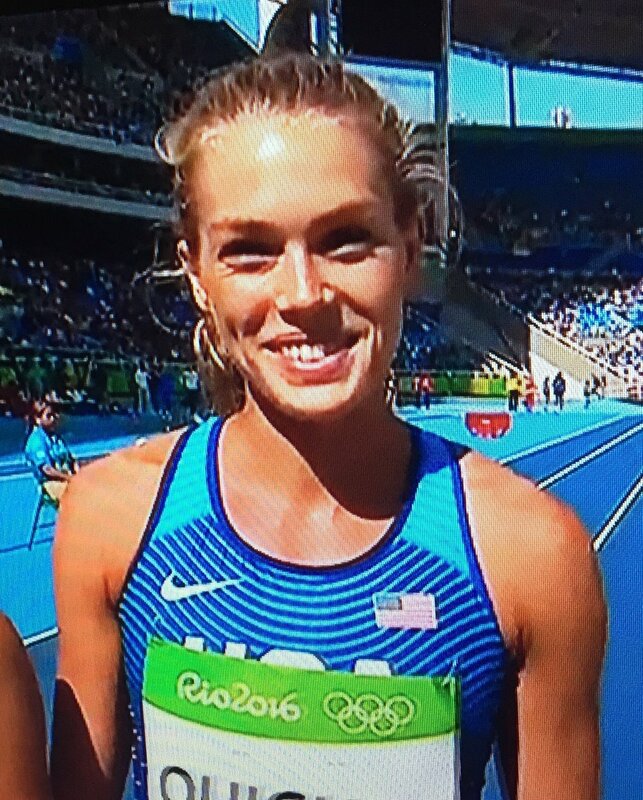 I placed 4th in a time of 9:21, which matched my PR and the time I ran to qualify for the Olympics in Eugene. It was good enough for 8th overall and a spot in the final. Two days later I toed the line again, placed 8th overall again, and ran 9:21 yet again! To be honest, I was looking for a little more out of myself in the final, but on that day I gave it everything I had and fought for every second, even leaning to pass a runner right at the line. Right from the start of the race I didn't feel completely myself, still slightly tired and sore from the prelim. 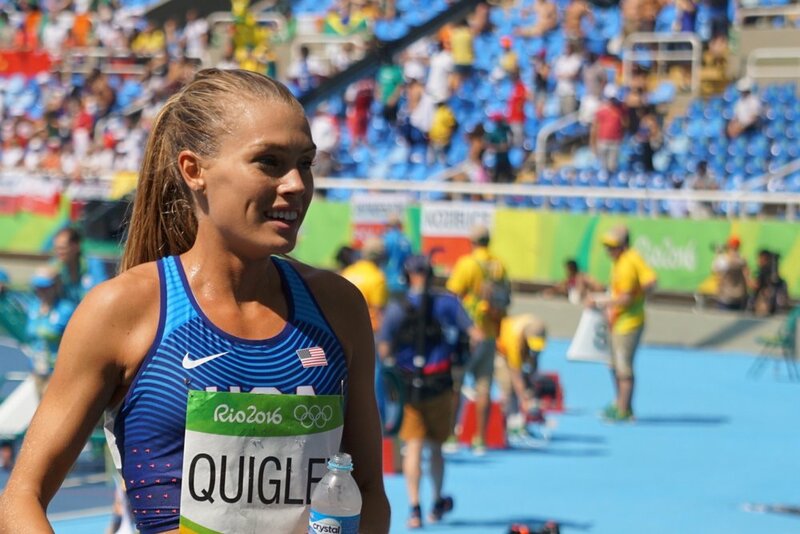 It was by far the hottest day we had had yet in Rio, and I felt the heat zapping my energy on the warmup. 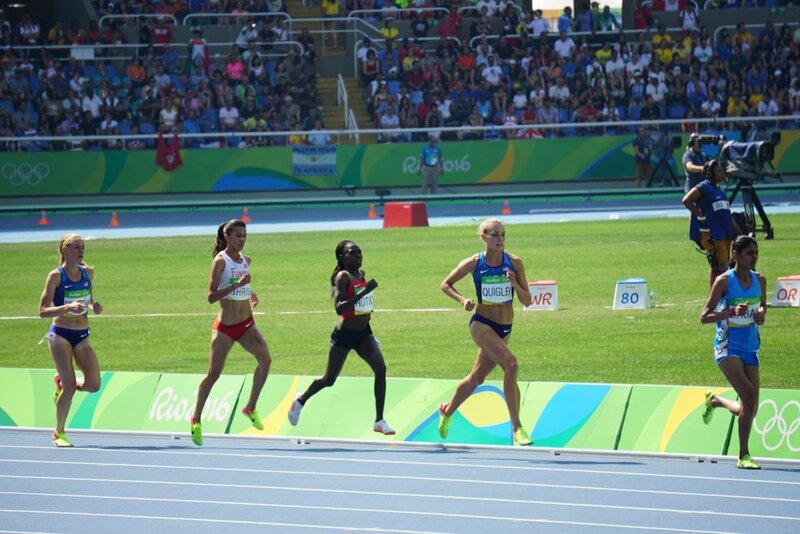 All in all, I am walking away from the experience feeling proud of my first Olympic appearance. 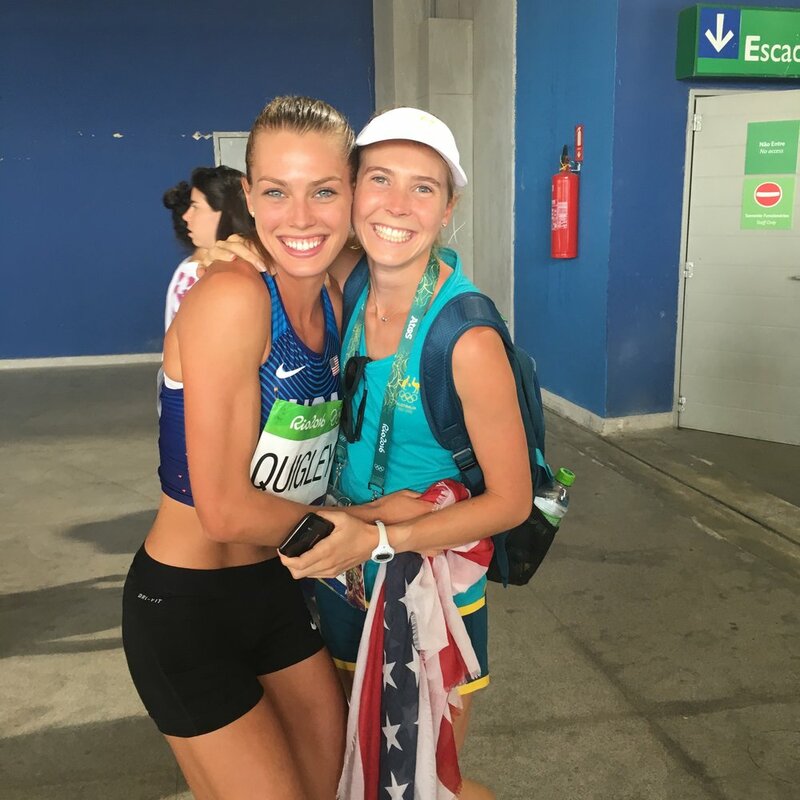 To think that just a few short months ago I would have been over the moon about just being in the final, I have to remember to be grateful for such an amazing experience and to have the ability to step on the track healthy and compete against the best steeplechasers in the world. 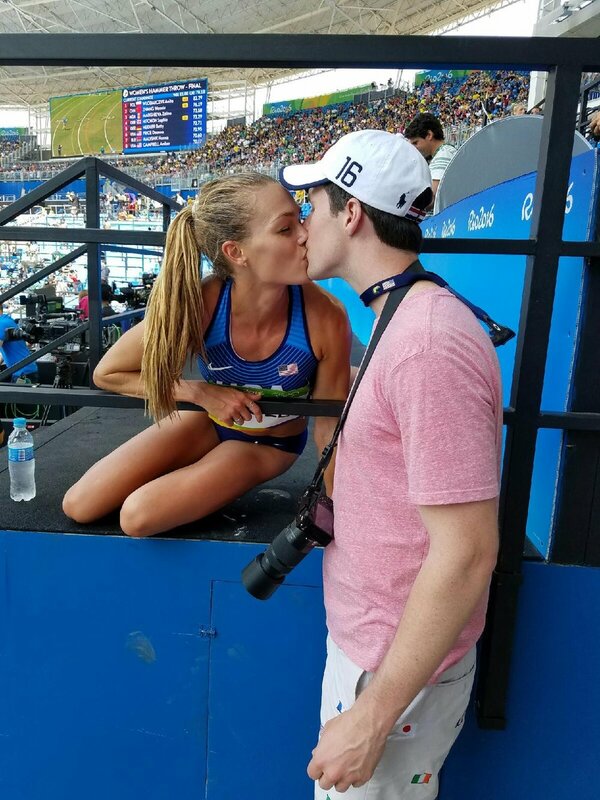 The other highlight of the day was that my USA teammate Emma Coburn was able to nab a bronze medal, making it the first time an American female won an Olympic medal in the steeplechase since it was added as an Olympic event in 2008. Since the final was held in the morning, I had all afternoon to hang out and celebrate with my family. The first thing we did was go to the Nike hospitality house for food! After feasting, we checked out all the fun stuff Nike had to offer. The boys (my dad, brother, uncle, and boyfriend) went directly to the golf course to play a few holes and pick up some fresh Nike golf shoes. The girls (my moms, sister, aunt, and I) went to pick up my swag bag filled with all kinds of goodies, personalized sunglasses, a new pair of personalized shoes, and a personalized "Unlimited Colleen" tshirt. We also checked out the Nike salon where athletes and their families could get their nails done, hair cut and styled, and even get a massage. The girls also picked up some ice cream before heading out. After Nike we headed down to Ipanema where the USA House was. We spent the evening watching track events on the big screen, enjoying food and drink together as a family, and meeting some amazing American Olympians! My sister went around asking Olympians to sign an American flag that she gave to me at the end of the trip. This was an awesome night for my family to really enjoy the trip together and just be grateful for such an incredible experience that we could all share. 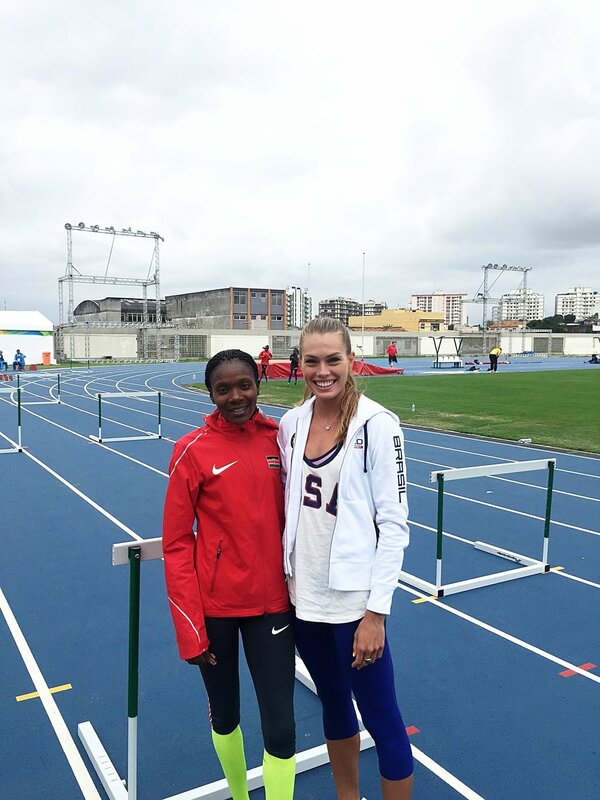 I couldn't stay too long in Rio after my race, I had to head to Europe to finish my season with a couple more steeplechases. Before leaving, I got some time to explore the beautiful city of Rio with my family. We took an afternoon and hiked up Morro da Urca (the mountain next to the iconic Sugarloaf mountain) where we then hopped on the cablecar that took us to the top of Sugarloaf. From there we had a beautiful view of the city of Rio and were even able to spot our hotel! We also got the chance to walk the beaches in Praia do Flamengo and Copacabana and do a little shopping. My family took a trip to Christ the Redeemer on the day between my two races, but I had to rest up and let them show me the pictures later. 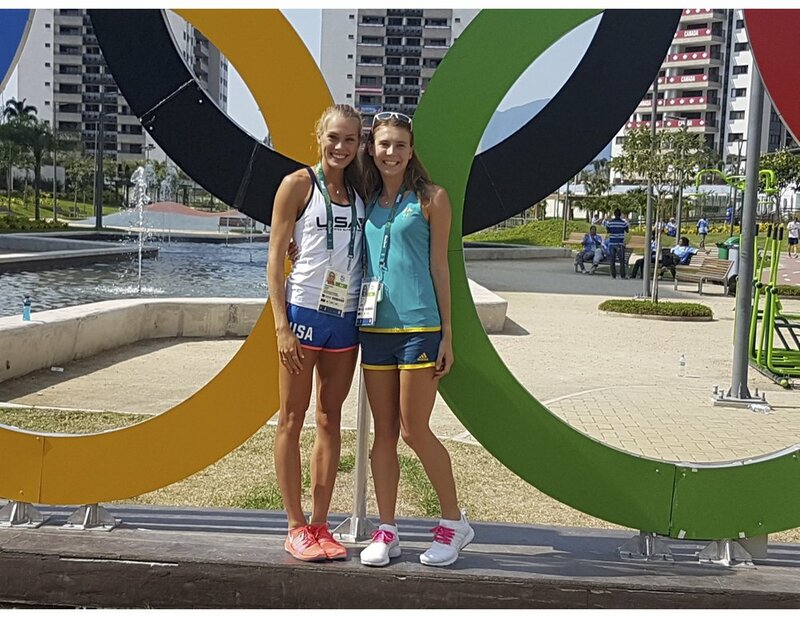 Lastly, I got to check out the Olympic village via a quick tour with my old teammate from FSU, Linden Hall, who competed in the 1500m for Australia. The village was impressive with its ginormous dining hall, beautiful pool, free Mcdonalds, and endless tennis and basketball courts. It looked like a great place to hang out with other athletes after competition, but I unfortunately didn't have enough time to stop and enjoy!